새로운 지역에 교회를 개척 또는 목회자 없는 연약한 교회를 일으켜 세우기 위한 목적으로 북아시아태평양지회가 시작한 세계선교 사업이다. 이 운동의 목표는 잘 준비되고 선교정신이 충만한 목회자들을 해외선교 지역에 파송하는 것이다. 그들은 재림기별이 들어가지 않은 전도지역이나 자생력이 미미한 교회에 보내질 것이며, 세 천사의 기별을 전파하여 예수 그리스도에 대한 지식이 없어 소망없이 살아가는 수많은 사람들에게 복음을 전하게 될 것이다. 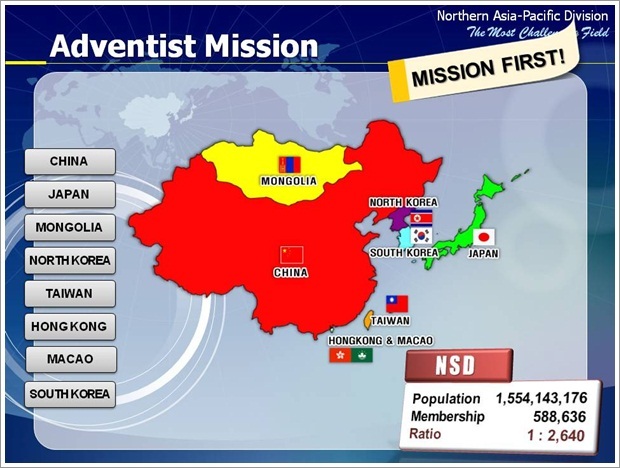 PMM is a Global Mission Project of the Northern Asia-Pacific Division(NSD) for planting new church and nurturing the established but weak church in its territories. Its goal is to send as many church pastors as needed to other countries basically within NSD territories, and also outside the NSD territories for cross-cultural missionary work. These pastors will be sent to primarily unentered territories where no Seventh-day Adventist church exists, and also to be sent to the weak churches. They will commit themselves to enhance the second coming of Christ with Pioneer Mission Spirit. 세계 인구의 약 4분의 1에 해당되는 15억의 사람들이 살고 있으며, 그리스도인은 겨우 3% 정도에 불과하고, 나머지 97% 는 불교, 신토, 모슬렘, 무속신앙, 혹은 무신론이다. 북아시아태평양지회의 선교지역은 몽골, 중국, 대만, 홍콩, 마카오, 일본, 북한, 그리고 한국이다. 이 지역은 젓가락 문화라 할만큼 중국, 일본, 한국의 3대 문화가 주류를 이루고 있다. 다양한 문화를 가진 광활한 지역인 만큼 우리의 선교적 도전도 대단히 큰 곳이다. 이 도전에 PMM 선교사들이 재림의 날을 앞당긴다는 일념으로 오늘도 있는 곳에서 최선을 다하고 있다. NSD is the largest Division in terms of the population and number of non-Christians. About 1.5 billion people, around one fourth of the world population, reside in the NSD territories. Among this huge population, only 3% are Christians, and the other 97% are Buddhists, Shintoists, Muslims, Shamans, and Atheists. Challenges are great everywhere in this area. The Pioneer Missionary Pastors will be sent to every nation, tribe, tongue, and people as Golden Angels having the everlasting gospel message in their hands. By launching this project, the churches in the NSD territories will see a significant step toward the accomplishment of the gospel commission, the enhancement of the second coming of Christ.